Origin of Stage Name: Thought of it with her family. Yuri is her real name, oto (sound, voice) is because she wanted to become a good singer, and hana (flower) was chosen as the one that fits musumeyaku best. 2005: Shigure Hill Road in Nagasaki / Soul of Shiva!! Her mother is a former Takarasienne, Akeho Memi, and her younger sister is an actress, Aibu Saki. 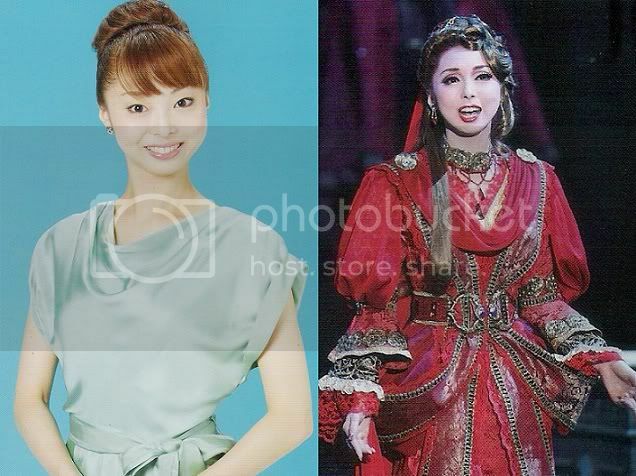 She has been a Takarazuka fan since childhood. One of her nicknames, Pochi, is a very common dog name in Japan. The 87th class graduates assigned to Star Troupe formed a kind of family, where Tsurumi Mayuu was chosen as a father, Minaho Sari as a mother, Yumeno Seika was a son, Junka Marii a daughter, and Otohana Yuri was a puppy. Member of the 3rd & 4th groups of Sky Reporters. Married in February 2018 and announced she would be taking a break from working onstage. Created by caithion. Last Modification: Thursday 14 of June, 2018 11:47:24 PDT by caithion.